One of the first aircraft used for surveillance was the Rumpler Taube during World War I, when aviators like Fred Zinn evolved entirely new methods of reconnaissance and photography. The translucent wings of the plane made it very difficult for ground-based observers to detect a Taube at an altitude above 400 m. The French also called this plane "the Invisible Aircraft", and it is sometimes also referred to as the "world's very first stealth plane". German Taube aircraft were able to detect the advancing Russian army during the Battle of Tannenberg (1914). Spy flights were a source of major contention between the US and Soviet Union during most of the 1960s. Predator UAVs have been used by the US for border patrol. 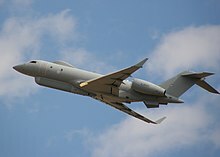 Unmanned (UAV) surveillance aircraft have been "deployed or are under development in many countries, including Israel, the UK, the United States, Canada, China, India, South Africa and Pakistan." Drones are increasingly used in conservation work to complete tasks such as mapping forest cover, tracking wildlife, and enforcing environmental laws by catching illegal loggers or poachers. Unmanned surveillance UAVs include both airships—such as Sky Sentinel and HiSentinel 80—and airplanes. the Beechcraft King Air 350ER is a platform for ISR versions, including L3’s Spyder II and Sierra Nevada Corp.’s Scorpion and as the MC-12W for the U.S. Army. ^ F. Stansbury Haydon, Military Ballooning During the Early Civil War, pp. 5–15. ^ Charles Coulston Gillispie, Science and Polity in France: The Revolutionary and Napoleonic Years, pp. 372–373. ^ "Reds, U.S. Face Hot Plane Debate at U.N.". The Paris News. Paris, Texas (US). Associated Press. May 23, 1960. p. 1. ^ "LA Now – Southern California, December 7, 2009,". Latimesblogs.latimes.com. December 7, 2009. Retrieved May 20, 2010. ^ Rogers, Simon (2012-08-03). "Drones by country: who has all the UAVs?". the Guardian. Retrieved 2019-03-19. ^ Koh, Lian Pin and Serge A. Wich. 2012. “Dawn of Drone Ecology: Low-Cost Autonomous Aerial Vehicles for Conservation.” Tropical Conservation Science 5(2):121–32. Retrieved March 4, 2019 (https://journals.sagepub.com/doi/abs/10.1177/194008291200500202). ^ Perry, William D. (Fall–Winter 2010). "Sentinel in the Sky" (PDF). Technology Today. Retrieved 2014-08-16. ^ Graham Warwick (Jan 10, 2018). "Spotlight on Bizjet-based Special Mission Aircraft". Aviation Week & Space Technology. US Centennial of Flight Commission: "Military Use of Balloons During the Napoleonic Era". Retrieved April 1, 2007.